Being a connected educator has allowed me to develop my capacity as an educational leader and learner. Over the last few years I’ve connected with a number of brilliant and passionate people who have inspired me to find and share my voice through chats, podcasts, research, and blog posts. One of those professional learning network connections is Jeff Zoul, teacher, leader, presenter, author and someone whose work I follow and admire. Last year I received an exciting email from Jeff. He invited me to be part of a project with nine tremendous educational leaders. In his email Jeff shared a bit about the project and I immediately knew that I wanted to be part of it. The book project is titled #EdWriteNow VII and the plan was to write the book over a couple days AND publish 6 months later. I was familiar with #EdWriteNow Volume I and the great organization associated with the project, The Will to LiveFoundation. The Will to Live Foundation is an organization dedicated to the prevention of teen suicide. Not only would I have an opportunity to pen a project with a group of people who I admired, but I would be able to contribute to a great cause. I said YES, of course, and we made plans to connect in Chicago in July. The writing experience in July was unlike anything I’ve experienced before. Jeff, Lauren Davis from Routledge, and Sanee Bell were incredibly supportive listeners and coaches throughout the process. We brainstormed, joked and shared, and agreed on Culture and Relationships as our focus. As educational leaders and learners, we value the power of relationships and the impact on culture in our organizations. We knew that the focus would allow us to create a book that everyone in our learning communities would benefit from. 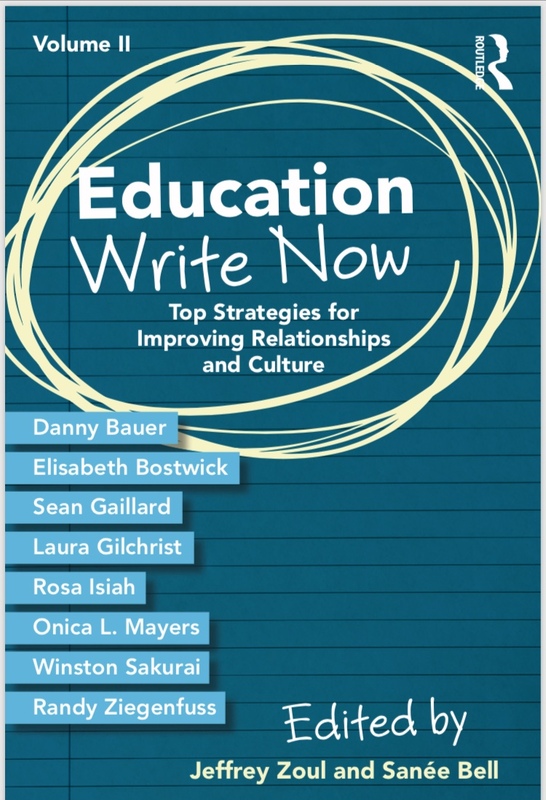 After two days of sharing, connecting, dinner and beverages, and a missed morning alarm (yes, that was me), Education Write Now: Top Strategies for Improving Relationships and Culture was born. It is a POWERFUL resource and we can’t wait to share it with you! Over the next few weeks every author will share a reflection on the project and an excerpt from their individual chapters. Our book authors include Sanee Bell, Jeff Zoul, Danny Bauer, Elisabeth Bostwick, Sean Gillard, Laura Gilchrist, Onica L. Mayers, Winston Sakurai, and Randy Ziegenfuss. Please check out the latest post from Randy Ziegenfuss- Relationships: The Foundation of Learner Centered Environments. It’s an excellent read! Elisabeth Bostwick is up next and I look forward to reading her reflection next week! My chapter is titled Connecting with Every Student: Creating a Culture of Equity and Access. I’m proud to share it with you and hope it inspires you to grab a copy of Education Write Now Volume II in December. Thank you for learning with me and for supporting a great cause for teens, the Will to Live Foundation and teen suicide prevention. Meaningful connections and strong relationships are the foundation for learning. When students feel that we understand who they are and that we authentically care, they take emotional risks and they open their hearts and minds to connecting and learning. Relationships matter. As a teacher, my most important mission was to develop a deeply trusting connection with every student in my classroom. I didn’t always meet my goal, but I poured my heart and soul into trying. Connecting with students, understanding who they are and the gifts that make them special, continues to be paramount to my work as a school administrator. Over the course of my 24 years in education, I have witnessed the power of connections transform the lives of students AND teachers. We all have stories to share about students who taught us incredible life lessons about learning, resilience and empathy. We also have stories about students who found their voices when they connected with a teacher who believed in them. Those transformational connections are fostered through authentic relationships. They are powerful. Throughout my 24 years I have also witnessed a troubling pattern. I’ve observed that we are not always willing to give some students the same opportunities to connect that we may afford others. Marginalized students - students of color, socioeconomically disadvantaged youth, English learners, and especially trauma impacted students - are sometimes perceived as “high-need” and “difficult” to understand and connect with. I speak from personal experience and I know that I’m not alone. Educators care about students and many dedicate their lives to teaching, but something is missing if we are leaving some of our most vulnerable students behind. How can this be, if after all, it is our moral imperative to positively influence, nurture, guide and empower our students? Are we lacking the will to connect with marginalized students or are we lacking the skills to do the heart work? Connections and relationships are the key to establishing a culture of equity and access for all in our educational settings. When we fail to provide equitable learning opportunities and emotionally invest in some of our students, the message to those left behind is that they are not worthy of our time and our efforts. It will be impossible to close achievement gaps and develop a culture of equity and access if we do not invest the time to forge relationships and develop strong connections with our students, even when it’s difficult. ESPECIALLY when it’s difficult. It is our moral imperative to do better for every-single-student we are privileged to work with.